Pilates Classes Huntington Beach: Get a Group Together! No matter how old you are, walking into a new environment by yourself can be a bit intimidating. You had a similar experience if you were ever the new student at a new school, and the same can be true when you walk into a new gym for the first time. At SweatHB, we want everyone to feel welcome every time they come to our gym, but we understand that having the support of friends can go a long way in wanting to come back each time. If you have a group of friends who want to sign up for Pilates class, visit us in Huntington Beach today! One of the biggest impetuses for getting back in the gym is getting in shape. If you have friends who have similar fitness goals, it can make it easier to sign up for a class and attend regularly. Going on your own can be just as beneficial, but by switching off who’s driving each week, as well as the encouragement you can give each other during class, you can experience greater success in a shorter period of time. We have more than Pilates classes available at our gym, and you can come from a RealRyder™ spin class, a Wall Tower and Chair Class, or a combination of all our classes. Who knows? 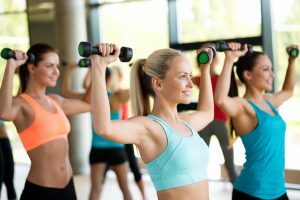 Your friends who aren’t currently working out on a regular basis may want to join in, and you can have an even bigger group that goes to the gym! Contact us today to learn more.